The presidential campaign of Barack Obama was met with enthusiasm and controversy. If you were alive and cognizant at the time, you understood the importance and historic value of the 2008 election no matter your position. Barack Obama, the Hawaii-born Senator representing the state of Illinois, was the first black1 candidate nominated by one of the two major political parties. Never before had there been a black candidate as viable to win the presidential election. The uniqueness of the Obama campaign led apolitical groups to actually get out and participate in the political process. The fervor surrounding Barack Obama during the 2008 presidential race peaked in the months following his win. America’s turbulent history with race was said to have halted with the election of President Obama. Many asserted that because the American public elected a black man to the highest office in the land, barriers hindering minority groups had been struck down. No longer were racial distinctions relevant to socioeconomic status or achievement because the first non-white executive leader was also the first post-racial president. Some suggest that the election of Barack Obama has fulfilled the dream of Martin Luther King Jr. that all be judged based on character rather than the color of their skin. They point to his win as evidence that all Americans now lay on equal footing in pursuit of success. These sentiments ignore the absence of Latino and Asian executives, in addition to the existing disparities between racial groups in terms of educational opportunities, income, and wealth. Moreover, they assume that simply having a black person fill an influential position results in improvements for all members of that racial group, regardless of whether policy implemented is targeted towards them. I find contradictions between these assumptions and the reality we live in today. "Some suggest that the election of Barack Obama has fulfilled the dream of Martin Luther King Jr. that all be judged based on character rather than the color of their skin... [but] they assume that simply having a black person fill an influential position results in improvements for all members of that racial group, regardless of whether policy implemented is targeted towards them. I find contradictions between these assumptions and the reality we live in today." 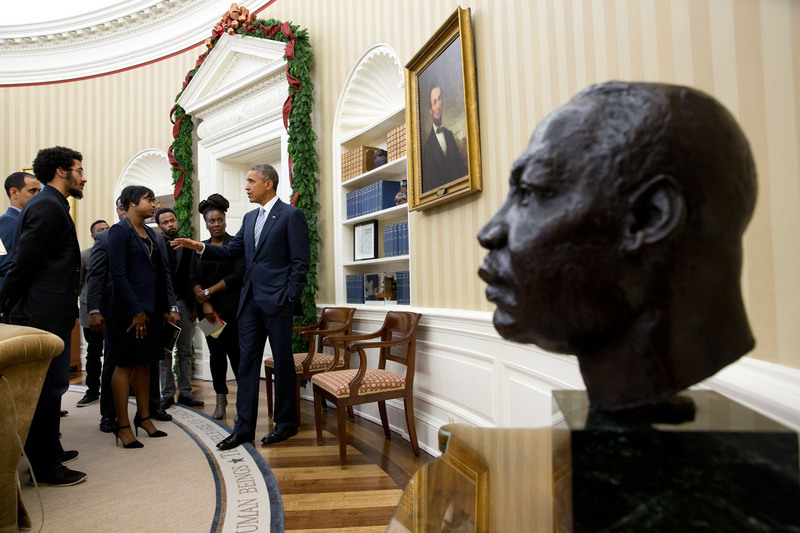 Top: President Obama in the Oval Office with a bust of Martin Luther King Jr. in the foreground. 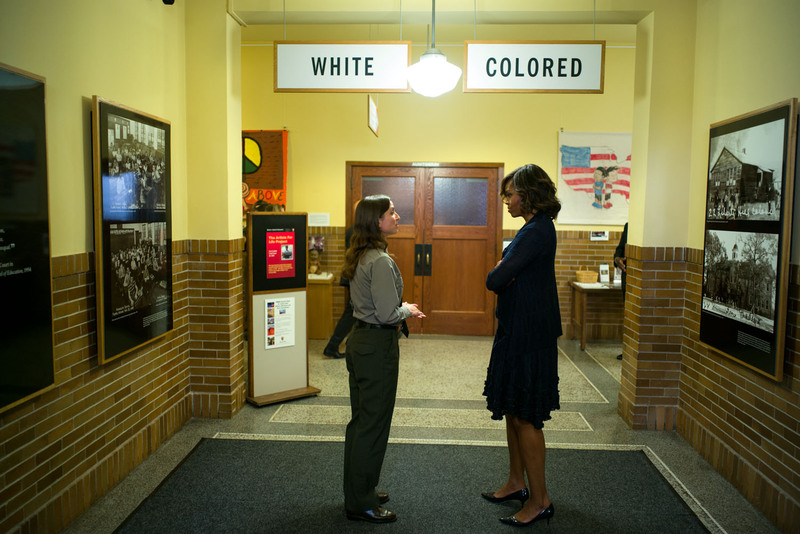 Bottom: First Lady Michelle Obama at the Brown v. Board of Education National Historic Site. Photos: Pete Souza/White House. In this article I examine the premises of a post-racial society in order to disprove that President Obama is indeed the first post-racial president. The presence of ‘colorblindness’ within a society is suppose to deem it post-racial, however my analysis will show that it simply encourages assimilation instead of destroying racial barriers. Further, meritocracy within color-blind and post-racial theory is disproven by existing disparities between racial groups in wealth, housing, and education. Post-racial attitudes have not helped to close the gaps between whites and non-whites, but have rather widened them. Instead of ‘race-conscious’ policy to address the disproportionate needs of racial minorities, support is only gained by ‘race-neutral’ policy. Barack Obama has led an agenda null of race-conscious policy because of the backlash he received in race-related events before and shortly after he entered office. Notably, his education reform lacks the equitable measures necessary to help the most disadvantaged students. Additionally, the Supreme Court’s recent rulings in school enrollment and admissions policies, have removed affirmative measures at a time when racial isolation and school segregation is growing. My analysis of the challenges people of color presently face will demonstrate that the declaration of Barack Obama as America’s first post-racial president is anything but accurate. Throughout our Race-based society, black people have experienced multiple periods of institutional boundaries set by their race. The first was slavery. The second came during the time of reconstruction. Jim Crow followed thereafter. And the Civil Rights movement fought to achieve the political freedom and economic power only granted to whites. The success of black leaders to propel the black population out of their caste and create a more ‘visibly’ equal society has led generations of whites since then to believe that America has become more fair. 4 In today’s media, race relations are depicted as harmonious. Due to the visibility within the public of elite black individuals with political and economic clout, white Americans now view race as less of a barrier. They believe that there is equal opportunity among the races to procure housing and employment, as well as, mobilize into the middle class.5 This belief ignores present institutional racism and biases; moreover it feeds into the concept of colorblindness. Colorblindness preempts a post-racial society. Given our nation’s terrible history with race, it is understandable that some may want to revise past and present transgressions. A world where race does not determine how a person is perceived or treated is ideal. Colorblind theory insists that the best way to move past race is to immediately stop recognizing and talking about it. 6 Numerous political theorists and scientists oppose colorblindness as a strategy to transcend race because it disregards the struggles of people of color today. Colorblindness has origins in a Supreme Court ruling that divided the country by race. Plessy v. Ferguson affirmed the southern states’ use of ‘separate but equal’ public accommodations. Justice Harlan gave a dissenting opinion in the decision stating, “Our Constitution is color-blind, and neither knows nor tolerate classes among citizen.”7 Harlan overlooked the many instances within the Constitution where individuals are treated differently based on their color. Current advocates of colorblindness continue the tradition set by Harlan in their arguments against policies such as affirmative action. Colorblindness contends that society, particularly government, should never take race into account. This theory relies on equal footing by all citizens to begin with, thereby making the use of race in policy always discriminatory. Strict colorblindness does not allow race to be used in promotion of diversity. 8 Many Americans today believe that the use of race by the state unfairly or unnecessarily promotes racial diversity. Due to the increased relevance of colorblind theory, individuals in position of racial privilege are now less likely to positively view policy that isn’t ‘race-neutral.’ 9 Colorblind and post-racial theories assess individual potential in terms of merit. Meritocracy describes a social system where wealth, jobs, and power are distributed based on merit. The system is considered just and ideal because it only involves inputs that are attainable by all. Meritocracy is free of bias and encourages social mobility.10 The American dream hinders on meritocracy; that all are rewarded fairly for their hard work. Colorblindness operates within a type of meritocracy disregarding racial hierarchy in socioeconomic opportunities. Post-racial theory imagines a society without institutional racism, where existing racial barriers to upward mobility are removed. 11 Those who denote Barack Obama as the first post-racial president likely view his election as an individual achievement easily replicated by other black people willing to put in the work. In our supposed post-racial environment, achievement and failure are linked to individual effort; systemic oppression and institutional discrimination are unaccounted for. The greatest problem of the current post-racial society is that it doesn’t exist. Simply believing that racial barriers have been broken doesn’t mean that they have. There is statistical evidence that demonstrate the differences in privilege and opportunities between racial groups. This data is ongoing and continues throughout President Obama’s administration. The disparities did not disappear once he was officially in office, nor did they lessen. The truth is all Americans are not rewarded justly for their work. Institutions still actively work or passively allow discrimination against racial minorities. Whites have a greater advantage in the present race-based society than all other racial groups. They lead non-whites in terms of income, wealth, and education. The U.S. has maintained a plethora of racialized policies over the course of the nation’s history. These policies have played a substantial part in the racial wealth gap. Such policies include: the appropriation of Native Americans’ land, the sanctioning of African people for slave labor, the use of housing, educational, and economic segregation to isolate people of African descent, the use of citizenship status to marginalize Latinos, and the adoption of exclusionary laws to prevent Asians from purchasing land or owning businesses.12 The harmful effects of these policies continue with contemporary discriminatory practices. The subprime mortgage crisis serves as one of the more recent examples. Household wealth dropped dramatically in 2009. The median net worth of U.S. households declined from $96,894 in 2005 to $70,000 in 2009. The decline was not distributed evenly across racial groups. Non-white households experienced greater losses than white households. The unequal loss can be attributed to the greater dependence of minority households on home equity as a source of wealth.13 Whites have greater asset diversity than people of color do. The majority of white households have three other asset types in addition to their primary residence. So even if white homeowners were subject to the same type of discriminatory and predatory practices by lenders that targeted communities of color with faulty mortgages, they would not have experienced the same loss of wealth. Data used in the analysis derived from the Panel Study of Income Dynamics (PSID), a national longitudinal study conducted since 1968. The working-age households were tracked from 1984 to 2009.15 The study lacked in data collected or tracked from Latino, Asian, and immigrant households, so the specific focus is on the black-white divide. Nevertheless, the evidence gathered on black households can be applicable to the dynamics of many communities of color. Homes are the largest investments of the majority of American families. Homes account for the greater part of black families’ wealth given their smaller investment portfolios. Becoming a homeowner is a great accomplishment for black Americans as they face prejudice and economic barriers throughout the process. Consequentially, housing communities today have de facto racial segregation. Black Americans are the most recent class of homebuyers and are most vulnerable to foreclosure due to risky mortgages.19 When the housing crisis occurred, blacks suffered more than whites because the majority of their wealth was invested in high-risk properties instead of diverse assets. The ideal investment portfolio of a family should consist of liquid, tangible, and financial assets. Liquid assets act as buffers during times of economic instability. They can be easily turned into cash to provide the first line of defense to a family suffering a sudden hit to their income. Black households have very little liquid wealth. On average, blacks had a median liquid wealth of $200 in 2011. Conversely, whites had an average of $23,000 in assets available for liquidity.20 The stark contrast does not reflect the financial responsibility of either group, as there are minimal differences in the amount of their unsecured debts. Significance lies in the type of debt each group procures. 1.) ‘Black’ is used throughout this work to describe U.S.-born and naturalized citizens of African descent. The description does not take self-identification of race into account. 2.) Wilbur C. Rich, Post-Racial Society is Here: Recognition, Critics, and the Nation State, (Routledge: Taylor and Francis), 13. 3.) Rich, Post-Racial Society, 18. 4.) Rich, Post-Racial Society, 26. 5.) Charles Gallagher, “Color-Blind Privilege: The Social and Political Functions of Erasing the Color Line in Post Race America,” Jean Alt Belkhir, Race, Gender & Class Journal 10 (2003): 23, accessed November 12, 2014, http://www.jstor.org/stable/41675099. 6.) Ian H. Lopez, Dog Whistle Politics: How Coded Racial Appeals Have Reinvented Racism and Wrecked the Middle Class, (USA: Oxford University Press), 78. 7.) Lopez, “Dog Whistle,” 80. 9.) Gallagher, “Color-Blind Study,” 25. 10.) Leanne S. Hing et al., “The Merit of Meritocracy,” Journal of Personality and Social Psychology 3 (2011): 433, accessed November 15, 2014, doi: 10.1037/a0024618. 11.) Gallagher, “Color-Blind Study,” 27. 12.) William Darity, “Beyond Broke: Why Closing the Racial Wealth Gap is a Priority for National Economic Security,” Center for Global Policy Solutions (May 2014 report): 2, accessed November 23, 2014, http://globalpolicysolutions.org/wp-content/uploads/2014/04/Beyond_Broke_FINAL.pdf. 13.) Richard Fry et al., “Wealth Gaps Rise to Record Highs Between Whites, Blacks, and Hispanics,” Pew Research Center (July 2011 Report): ch. 2, accessed November 14, 2014, http://www.pewsocialtrends.org/2011/07/26/chapter-2-household-wealth/. 14.) Sam Osoro et al., “The Roots of the Widening Racial Wealth Gap: Explaining the Black-White Economic Divide,” Institute on Assets and Social Policy (February 2013 Report): 1, accessed November 20, 2014, http://iasp.brandeis.edu/pdfs/Author/shapiro-thomas-m/racialwealthgapbrief.pdf. 20.) Darity, “Beyond Broke,” 10. 23.) David H Ikard et al., Nation of Cowards: Black Activism in Barack Obama’s Post-Racial America (Indiana: Indiana University Press), 108-110. 26.) David Sears et al., Obama’s Race: The 2008 Election and the Dream of a Post-Racial America (Illinois: University of Chicago Press), 32. 28.) Barack Obama, “A More Perfect Union,” Huffington Post (11/17/2008), accessed November 20, 2014, http://www.huffingtonpost.com/2008/03/18/obama-race-speech-read-th_n_92077.html. 30.) Lopez,”Dog Whistle Politics,” 199. 31.) Lopez, “Dog Whistle,” 195. 34.) United States Department of Justice, Fact Sheet: Racial Profiling (June 17, 2003): 1, accessed November 15, 2014, http://www.justice.gov/archive/opa/pr/2003/June/racial_profiling_fact_sheet.pdf. 35.) Barack Obama, “Blueprint for Change: Obama and Biden’s Plan for America,” (2008) accessed November 28, 2014, https://s3.amazonaws.com/s3.documentcloud.org/documents/550007/barack-obama-2008-blueprint-for-change.pdf. 36.) Robert Maranto, President Obama and Education Reform: the Personal and the Political (Palgrave Macmillan), 93. 39.) Amy Wells, “Seeing Past the ‘Colorblind’ Myth of Education Policy: Addressing Racial and Ethnic Inequality and Supporting Culturally Diverse Schools,” National Education Policy Center (2014): 10, accessed November 28, 2014, http://nepc.colorado.edu/files/pb-colorblind_0.pdf. 40.) Ikard, “Nation of Cowards,” 116. 41.) Wells, “Seeing Past,” 11. 42.) Cara Sandberg, “The Story of Parents Involved in Community Schools, “ Berkeley Law: University of California (2011): 6-7, accessed November 20, 2014, http://www.law.berkeley.edu/files/The_Story_of_Parents_Involved_Sandberg.pdf. 48.) Angelo Ancheta, “A Constitutional Analysis of Parents Involved in Community Schools v. Seattle School District No. 1 and Voluntary School Integration Policies,” Rutgers Race & L. Rev 297 (2008-2009) :312, accessed November 24, 2014, http://digitalcommons.law.scu.edu/cgi/viewcontent.cgi?article=1002&context=facpubs. 49.) Sandberg, “The Story,” 21. 52.) Ancheta, “A Constitutional Analysis,” 312-313. 53.) Wells, “Seeing Past,” 15. 54.) Thomas Santoro et al, “Fisher v. University of Texas at Austin (11-345),” LII Supreme Court Bullentin, accessed November 20, 2014, http://www.law.cornell.edu/supct/cert/11-345. 56.) Angelo Ancheta, “Brief of the American Educational Research Association et al. as Amici Curiae in Support of Respondents,” Sage Publication (2013): 191, accessed November 20, 2014, http://edr.sagepub.com/content/42/3/183. 58.) Sears, Obama’s Race, 1. Breanna M. Bacon graduated in 2015 with a Bachelors degree in Political Science from Northeastern University in Boston, MA.